The Ministry of Foreign Affairs attaches importance to the promotion of understanding, especially among members of the international community, of the current situation concerning the territory of Japan, as well as of the fact that Japan has long been contributing to the peace and prosperity of the region as a peace loving country. The Ministry’s priorities also include cooperation with members of the international community with a view to ensuring compliance with international law and to establishing peace and stability in the region. On the basis of the above mentioned priorities, the Ministry of Foreign Affairs has been promptly making firm protest against provocations such as intrusions into our territorial seas. 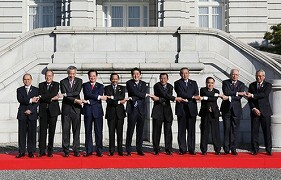 The Ministry also provides detailed and sincere explanation to foreign governments and other international players about the situation concerning the territory of Japan and our related views and position, in accordance with international law, using every single occasion available including high-level bilateral meetings. In addition, the Ministry of Foreign Affairs has been taking steps with a view to proactively and effectively communicating our messages to a wider audience at home and abroad. These include the Minister and ambassadors stationed abroad giving interviews with foreign journalists, giving press conferences and contributing articles to foreign media. The Ministry has also been delivering Japan’s messages to foreign experts and media through our overseas missions and through our websites, and has been making the best use of social media. Moreover, the Ministry of foreign affairs produces public relations materials on the situations regarding Japan's territory, which are uploaded on the Ministry’s website. As a result of these initiatives, support for and understanding of Japan’s legal position over our territory and our calm responses are increasing among governments, experts and academics, as well as media in the world. The Ministry’s initiatives are thus producing tangible results. The Ministry of Foreign Affairs will continue to provide detailed and sincere explanation of our positions to secure a broad support among members of the international community. The Ministry will also continue to promote effective communications in such a way that serves Japan’s national interests and the government’s policy objectives, in close cooperation with relevant ministries and agencies. Detailed information on the situation surrounding the Japanese Territory can be found in this section. Detailed information on the issue of Northern Territories can be found in this section. Detailed Information on the issue of Takeshima, as well as related fyers and movies can be found in this section. 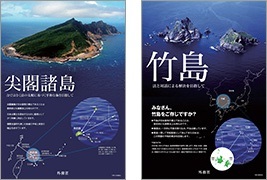 Detailed information on the situation surrounding the Senkaku Islands as well as related leaflets and movies can be found in this section. Information related to the activities of Chinese government and other vessels in the waters surrounding the Senkaku Islands, including the number of vessels that intruded the Japanese territorial seas can be found in this section.